Gliding motion, considered more gentle than rocking, adds a little something extra to your chair. 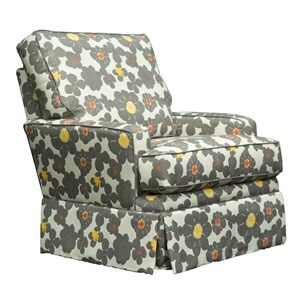 The soft glide makes this chair perfect for lounging on the three season porch or rocking a baby in the nursery. However you use it, you and your guests will love this plush chair with its comfortable feel and tailored look. Customize this piece in a rainbow of bright accent fabrics, including extra durable Sunbrella fabric options. 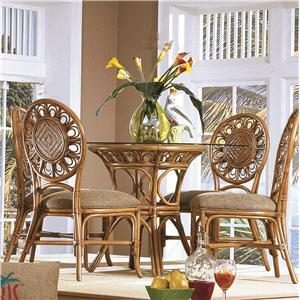 This wicker rattan table and chair set will create the perfect casual dining environment in your home. The glass top table features curvaceous wicker legs that are bound with leather for added strength and durability. The polished glass table top brings a feeling of brightness and openness to the room. The wicker rattan side chairs will make the perfect casual complement to your kitchen table. The upholstered seat cushions will keep you and your guests comfortable for a long, enjoyable meal. 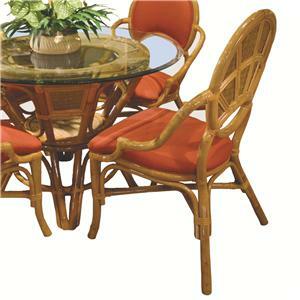 This wicker rattan arm chair will make the perfect casual complement to your kitchen table. The upholstered seat cushion will keep you and your guests comfortable for a long, enjoyable meal. This lightweight design is easily movable, but will withstand tough, daily usage. 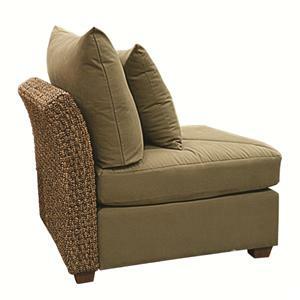 Framed in wicker, with a rattan laced seat back, you will love this comfortable, casual look in your home. Pair with the coordinating wicker based dining table for an excellent combination. 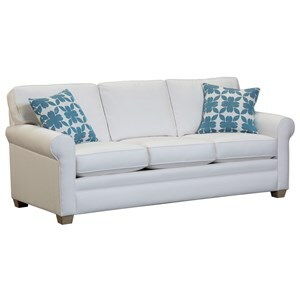 This sofa is a modest 83 inches long, making it a necessity for the modestly-sized apartment or condo. It has a laid back, casual look that's easy to style and even easier to enjoy. Sunbrella and other performance fabrics are available to order. A sofa upholstered in tough, stain-resistant performance fabrics stays pristine and lasts longer. This style is also available as a sleeper sofa. 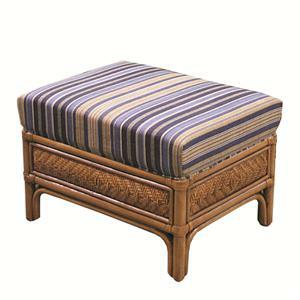 This wicker rattan based ottoman will make a lovely accent piece for your casual home. Pair it with the coordinating chair to use it as a relaxing footrest, or use it as a soft cocktail table in the center of a space to place a platter of snacks or drinks on. It also makes a perfect spare seat when entertaining a crowd. The lightweight frame is extremely durable and can withstand a great deal of daily usage. 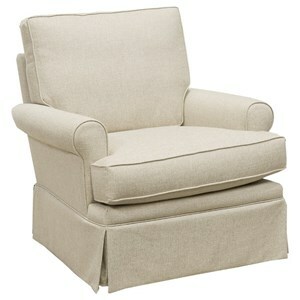 Add this swivel chair to your living room, bedroom, or nursery for a simple and chic accent chair. The skirted base adds a touch of feminine flair, while the sock arms and t-style seat cushion keep the look casual. Customize the chair by choosing from a variety of fabric options. Specially designed for the smaller spaces of today's more nomadic people, this loveseat can easily make the move between condos or apartments at 55 inches. 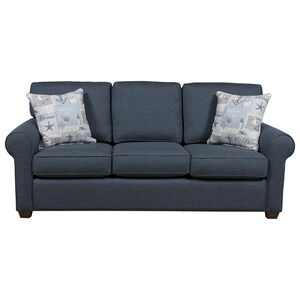 But don't be fooled by its small size- its packed with all the comfort and quality that you expect from your family's furniture. The contemporary styling forms the perfect blank canvas for all your decorating needs. Not only does this sofa look cool, casual, and comfortable, but its the perfect size for your place. At a modest 83 inches, even smaller urban homes can find the sofa of their dreams. The clean lines and tailored, rolled arms will look phenomenal in any style and color fabric you choose for it, including innovative, indoor-outdoor Sunbrella fabrics. See store for fabric options special order pricing. Add a light touch to your vacation getaway with this accent chair. 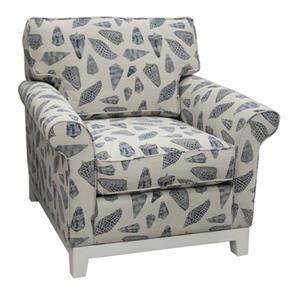 The piece carries a shell motif exterior and features rolled arms, gray-painted legs and loose cushions. There will be so much to like with this chair in your home. This casual armless seat will make a lovely addition to your living room, porch or den. The wicker rattan woven frame brings a carefree, casual look to any room. 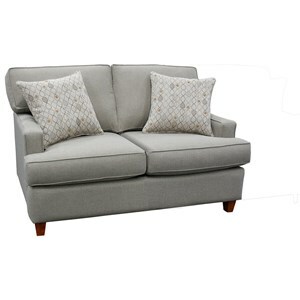 The loose pillow back offers deep comfort, and an accent pillow adds extra comfort and softness to the seat. Use alone as a single seat, or bunch a few of these armless seats together to create an armless bench or sofa. Capris Furniture offers a choice of furniture: bedroom, barstools and dinettes, and, for your living room, a choice of sofas, sectionals, ottomans, and accent furniture. The casual styles are great for the home and many feature wicker/rattan accents.